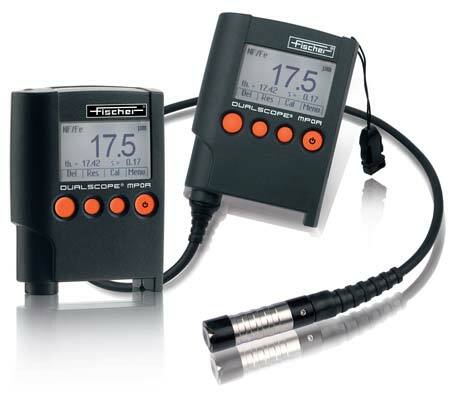 Coating Thickness Pocket Gauge - Fischer Measurement Technologies India Pvt. Ltd. Coating thickness pocket gauge – MP0 is a specially designed measuring instrument to measure coating thickness rapidly and accurately. This coating thickness pocket gauge - MP0 is perfect for instant anywhere use due to its small size, light weight and reliable design. These are crafted to perform operations like menu navigation and have graphic display. Coating thickness pocket gauge unveils the reading of measurement in seconds and displays it directly on the top. This coating thickness pocket gauge - MP0 is customized with different language options thus fulfilling the requirement of different language users. of thesurfaces, e.g., in the manufacture of tanks and containers. Normalization:Adaptation to the substrate material and the shape of the specimen. reference points care to ensure the highest possible degree of trueness. and to a thickness value using a calibration foil. (7.87 inches). This kind of calibration supplies only a lower accuracy. 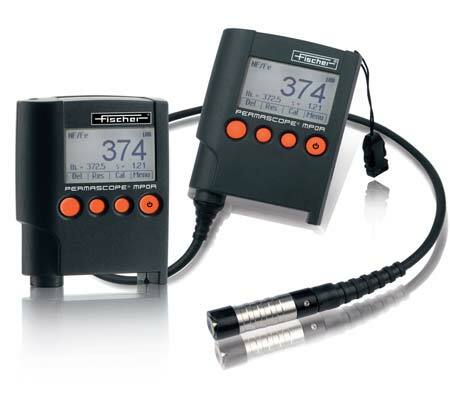 Coating thickness pocket gauge – MPoR is a pocket device with integrated USB for appropriate and quick coating thickness measurement on all metals effectively. Its structure and permeability have less effect on measurement result when compared with other devices. Coating thickness pocket gauge - MP0R has two remarkable measuring methodology in agreement with measurement regulation IMO PSPC (90/10-Rule) and SSPC.PA2. Coating thickness pocket gauge – MPoR is easy to carry as it is insubstantial and has resilient design which is highly appreciated in the market. of the top coating if for instance the interim coating is known. with the greatest care to ensure the highest possible degree of trueness. to a thickness value using a calibration foil. reference part with a coating thickness higher than 200 μm (7.87 inches). specified in the sections Trueness and Repeatability Precision. Coating thickness pocket gauge – MPoR-FP is a pocket instrument consolidated with PC for suitable and rapid coating thickness measurement on all metals adequately. Coating thickness pocket gauge - MP0R-FP has proprietary conductivity compensation for calculation on non-magnetic substrate materials. Coating thickness pocket gauge - MP0R-FP is portable due to its hard-wearing structure and it also ensures that it never fails while working under unfavorable conditions. MPoR –FP is available for all our customers at standard price. of the surfaces,e.g., in the manufacture of tanks and containers. The FISCHERSCOPE® UMP20, 40 and 100 measure wall thickness ultrasonically. 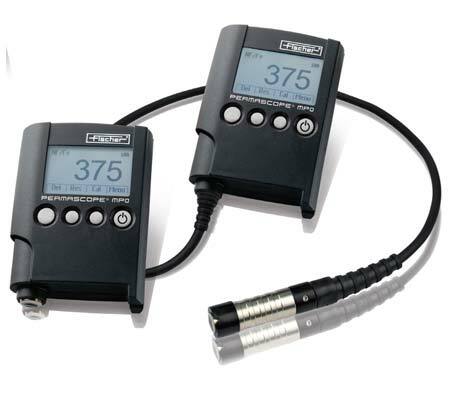 The gauges are compact and easy to use. 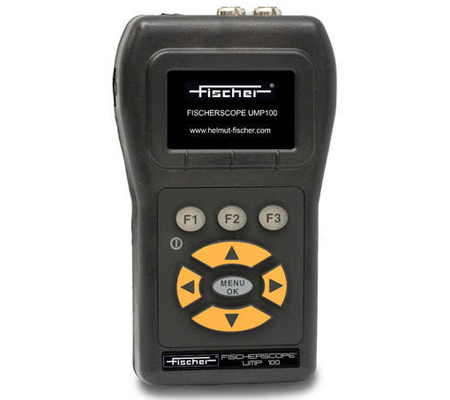 FISCHERSCOPE® UMP20: Entry level, eld upgradeable gauge can be used with three transducers. The standard and default transducer is the DKS-537 which measures from .040-20" in steel, the DC-250 is the preferred probe for more attenuating materials such as castings, and the DK-718 for thinner (.030" in steel) or smaller diameter applications such as boiler tubes. FISCHERSCOPE® UMP40: All of the features of the UMP 20 and a 100,000 reading Data- logger with the ability to export to Excel using PC Ultra Datex software. It also includes the ability to view B-Scans and Echo to Echo to ignore coatings. FISCHERSCOPE® UMP100: Includes live Color Waveform, 100,000 thickness readings via internal datalogger, DKS-537, 5MHz, .375 "diameter transducer with potted cable, Echo to Echo and B-Scan, USB cable USB-09-6 and PC Ultra Datex interface program to export saved readings to Excel. The FISCHERSCOPE® UMP150 measures wall thickness ultrasonically. Boiler tubes, coil steel, castings, rubber (tires), conveyor belts, berglass (boat hulls), gel coating, plastics(bottles), toys, tubing, ceramics, titanium(golf club heads), brass, aluminum, glass. 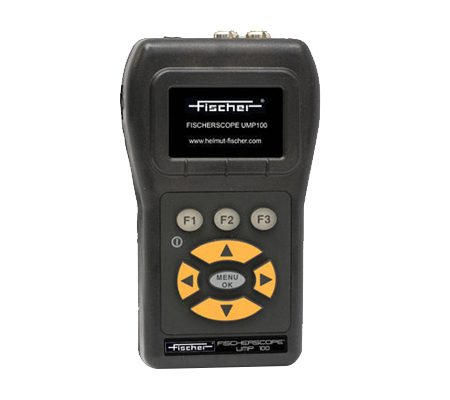 FISCHERSCOPE® UMP150: Hand-held digital ultrasonic precision thickness gauge with color display.